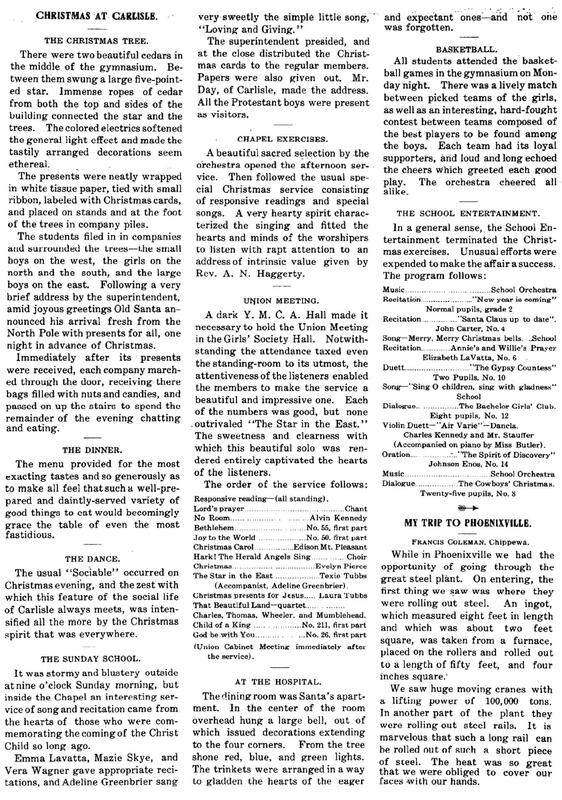 “A Happy New Year” wrought in red electric lights, and suspended across the gymnasium, welcomed the guests to the annual reception of the Standard Debating Society in the gymnasium last Friday night, and suggested the general theme of the evening’s entertainment. The event took the form of a farewell party to 1909 and a welcome to 1910, an idea which was carried out in the menu cards and souvenirs which each represented a dainty 1910 calendar. The Standard colors, orange and black, were attractively used in the decorations, and the music was good. The address of welcome was given by the president of the Society, Francis Coleman. A novel and very enjoyable feature of the program was the singing of “By the Light of the Silvery Moon” with all the lights extinguished except the tiny red ones in the Happy New Year sign. Just before midnight a seated supper was served in the Y. M. C. A. Hall. The menu consisted of chicken salad, wafers, maple nut ice cream, cake, fruit, mints and coffee. Mr. Whitwell, the Standards’ advisory member, as toastmaster, cal1ed for the following toasts: What standards have accomplished, Ray Hitchcock; Our sister and brother societies, R. Charles; Once a Standard, always a Standard, Mr. Nori. The cakes for the prize dances were awarded by the judges, Mrs. Foster, Mrs. Stauffer and Mr. Dietz, as follows: Twostep, lst, Ruth Lydick, Albert Lorentz; 2nd, Emma Newashe, John Farr; Waltz, lst, Rose Hood, Reno Rowland, 2nd, Inez Brown, Harry Woodbury. After the presentation of the prize cakes by Mr. Whitwell, a solo by Montreville Yuda, “I’m Going to Do as I Please,” set the merry feasters in an uproar of applause which lasted until the ringing of bells and the blowing of whistles proclaimed the arrival of 1910, Then a great wave of Happy New Year wishes swept over the hall, and all returned to the gymnasium to welcome in the New Year with dancing. This number was danced with the lights lowered and with only the red welcome to the New Year shining on the dancers. The home waltz ended the program. 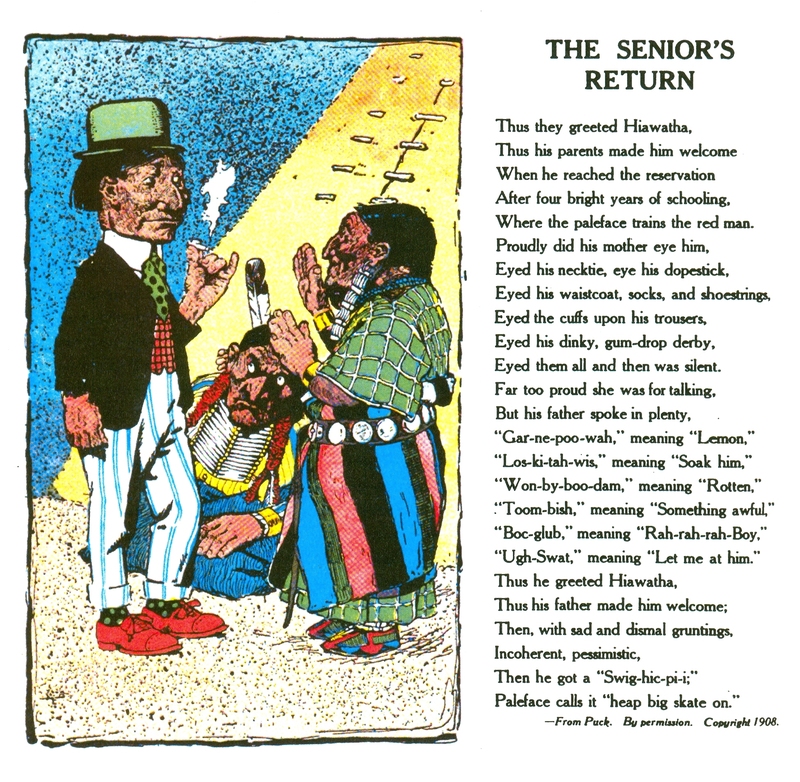 On more than one occasion, Puck Magazine parodied the return of a son from Carlisle Indian School to the reservation. The cartoon below is from a 1908 issue. That Carlisle did not prepare students for the lives previous generations lived is true. They weren’t taught to hunt or tan hides. They weren’t taught how to make bows and arrows. And they weren’t taught how to use weapons. However, many rose to positions of authority in their tribes because they could read and write English and had a better understanding of the white man’s culture. Those who did not return to the tribe tended to fare better because they could put the skills they learned at skill to use to support themselves. I just came across a photo of Frank Mt. Pleasant in his WWI army uniform. Unfortunately, there are a few errors in the associated text. He competed in the 1908 Olympics, placing 6th in both the broad jump and triple jump although injured at the time. In Paris, after healing, he beat the Olympic broad jump champ in a big meet. His name is misspelled in the caption under the dog. He was the first Carlisle Indian to get a degree, a Ph. B., from Dickinson College. However, some others previously got LL B. degrees from Dickinson School of Law. He has been inducted into the Dickson College and Indiana University of Pennsylvania halls of fame as an athlete and a coach, respectively. He was earlier inducted into the American Indian Athletic Hall of Fame. It is astounding that the Pennsylvania Sports Hall of Fame has not inducted him when you consider that the vast majority of his playing and coaching career was in Pennsylvania and he was a premiere athlete in two sports first at Carlisle Indian School and then at Dockinson College during his playing days. Joe Gilman was still in Minneapolis in 1917 when he registered for the draft on June 5. He and his family lived at 3218 Bryant Street and he worked as a salesman for Minneapolis Auto Laundry Company. He gave his date and place of birth as February 8, 1892 in Emily, Minnesota. He registered as an Indian but claimed no exemptions from the draft. Under prior military service, he claimed 4 years as an infantry 1st Sergeant at Carlysle [sic]. It may be that he was trying to get drafted. It seems unlikely that he did because his second child, Isabelle, was born in 1918 in Minnesota. Although Minneapolis Auto Laundry Company is an odd name for a company that sells automobiles, it might have been who Joe was working for when he wrote Carlisle in November 1916. 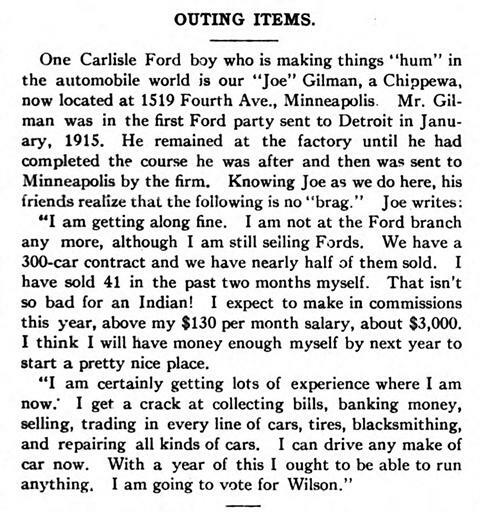 The 1920 census listed Joe Gilman as working for Ford Motor Company in Minneapolis as a salesman. It might be that his work ended when the 300-car contract was finished, causing him to return to the Ford branch. Family lore has it that he owned a Ford dealership, Gilman Motors Company, in Minneapolis that went bankrupt in 1922. He could have started that right after the 1920 census. According to family lore, after his bankruptcy Joe Gilman moved his family back to Detroit where he again worked for Ford as a salesman. At least for a time. The 1930 federal census listed him as living in Detroit but working for an unnamed soap company. His position was illegible but might have been salesman but probably wasn’t. The 1937 tribal role listed him as still living in Detroit. He left his family in 1943 and his daughter, Roberta, never saw him again after her wedding day. Needless to say, his grandchildren never saw him. He died in 1960 while in an Addicted Adult Program, which probably meant that he suffered from alcoholism. In July, The Carlisle Arrow announced that Joe Gilman and 18 other boys were receiving excellent reports for their work at Ford. On Sept 11 1915, Joe married Lydia Douglas 1 week before Lydia’s 17th birthday. In November the school reported on his marriage, stating the young couple, “..is getting on very well. Joseph has an excellent record at Carlisle, and great success is wished him by his friends.” The fact that this item appeared in the Alumni Department Notes column implied that Joe was no longer a Carlisle student. Lydia was a white girl who was born in Michigan to a father from Canada and a mother from Michigan. Joseph Gilman, Everett Ranco, and Norman Thompson, who went to Detroit last January, were promoted in July and are now receiving $5.00 a day.…Joseph Gilman expects to be transferred to Minneapolis, Minn., before long to do the same kind of work in the Ford plant there. Out of the score of nations represented in an automobile factory in Detroit it remained for an Indian, Joseph Gilman, a Chippewa, whose home is in Minnesota and who is at present enrolled at the Carlisle Indian School, to set the world’s record for assembling a car of that make. He had the machine ready for the road in two hours and fifty minutes after beginning work. The previous record was three hours. Roberta Carlisle Gilman was born on March 3, 1916 in Minnesota. Last summer when work was scarce and hard times had struck our country, Joseph Gilman, without any other credentials than his honest face and the fact that he was a Carlisle Indian, applied for a job at the Bethlehem Steel Works. He was one in a long line of men waiting for work. Hundreds had been laid off, but Joe was given a job and was told by the superintendent when he left that if at any time he wanted work he could find it there. On February 5, the first report on the boys’ progress at Ford. Joseph Gilman and Gus Lookaround are in rear axle department. They have been through the rear axle operations and are now on transmission, but Lookaround still has the repair job on rear axle to learn, as there was no room for him there. Their foreman says they are good and willing workmen, Gilman being especially apt. At school they have taken up work in English, arithmetic, and penmanship, and will later take up spelling and drawing. Gilman and Ranco have attended regularly, the others having missed some sessions. At their boarding place they are behaving themselves admirably and are general favorites. They are much interested in basketball, and their instructor says they show the best form for a winning team of any group he ever saw. They never seem to lose their tempers, even when the other team is purposely rough, simply laughing it off. They have the reputation for conducting themselves as gentlemen wherever they appear. How long Joe Gilman stayed in Minneapolis isn’t known nor is exactly what he did during this time period. Perhaps his Carlisle student file would shed a bit of light on it. We know that he eventually showed up at Carlisle because his name began to appear in the school’s newspaper. 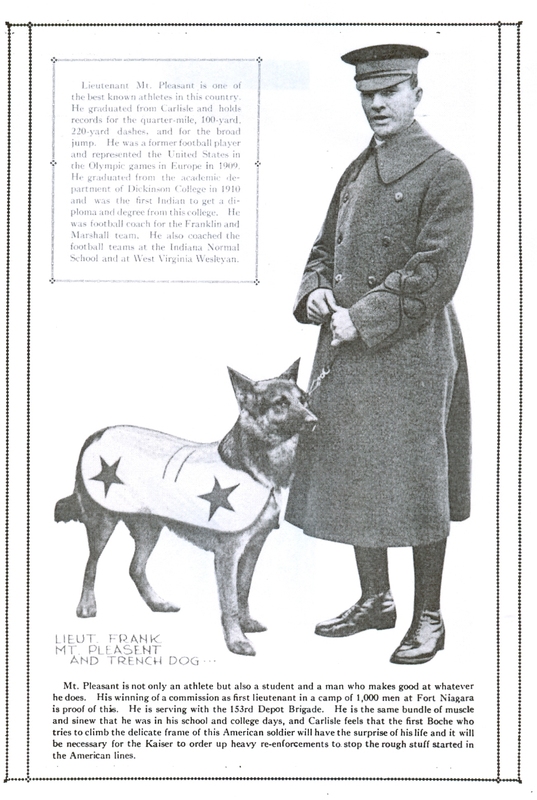 His first mention was for playing tackle in the first game of the 1913 football season against Albright College. He didn’t get further mention during the football season, probably because a more experienced player returned from summer break. Even though several star players left the team after each of the 1911 and 1912 seasons, the Indians sustained only one loss in each season from 1911-13. Joe Gilman was contending against some strong players. In December, he was listed as being in the receiving line with Mary Bailey at a reception held by the Susan Longstreth Society. Joe had either been at school for several years without receiving prior mention or had some education, particularly with English, prior to coming to Carlisle. Because he doesn’t seem to be listed on the 1910 Federal Census as being enrolled at Carlisle at that time, Joe probably hadn’t arrived many years before 1913. The Carlisle Arrow listed him as placing third in both 220-yard and 440-yard dashes in the handicap track meet held among students as part of 1914 Commencement activities during which Joe Gilman received an industrial certificate in blacksmithing. This implies that he was at Carlisle for at least two years prior to this. So, he likely came to Carlisle in 1911. However, he wasn’t finished yet. Joe returned for the 1914-15 school year and was promoted to the Freshman class. He also played football but, again, wasn’t a starter. He did get into the Penn game and probably more but the line-ups weren’t generally included in the school paper’s coverage of that year’s games. Joe Gilman was to be the starting center for the Freshman basketball team that winter but an opportunity in Detroit was of higher priority.